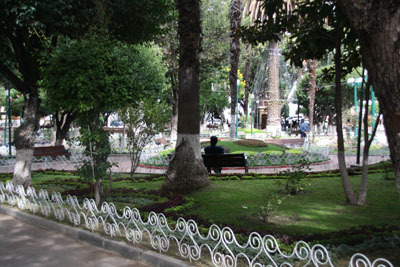 The Plaza 25 de Mayo formes the centre of the city. 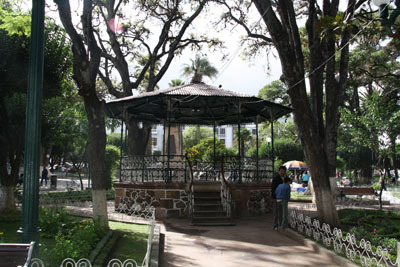 Surrounded by high palm trees it´s a lovely place to sit on one of the many benches and watch the people passing, reading a newspaper, chatting or having a salteña. 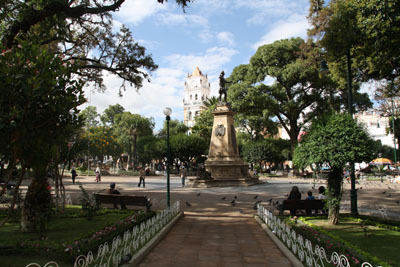 In the centre of the Plaza there is the statue of the Venezuelan-born independence hero Mariscal Antonio José de Sucre, first president of Bolivia and whose name the city bears. Around the Plaza there are several beautiful colonial, religious and republican buildings, painted so white that they shine underneath the blue sky.